22/10/2013, Four Muslim Sisterhood students in Alazhar University in Cairo, got Al-Jazeera Cameraman inside the university campus, and used one of the university Buildings with no permission from the university’s administration, for the purpose of faking death scenes and injuries against Sisterhood students, to smear the reputation of the Military and Police individuals in front of the international public opinion, in order to push the United States, to launch a military attack against the Egyptian Military, and get Muslim Brotherhood Regime to reign again. 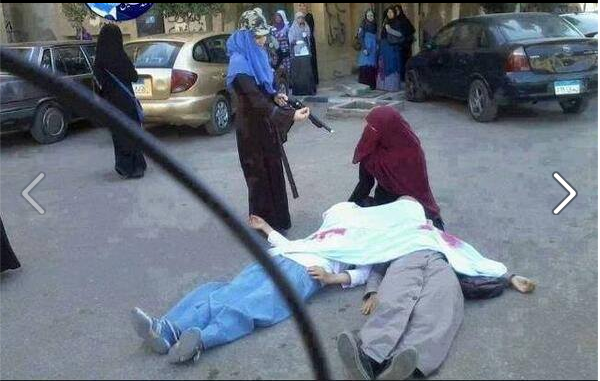 On 21/10/2013, Al-Jazeera News Agency, published a report with death and injuries scene, about three Sisterhood in Al-Azhar University, being brutally beaten and two of them were shot dead and killed by the Egyptian Military forces. Al-Jazeera reported that this torturing and death scene is a sample of what the Military individuals are practicing daily against peaceful Sisterhood students, which relate to the series of the persecution and oppression practices of the Egyptian State against freedom of speech and peaceful Muslim Brotherhood supporters protests inside the Universities in Egypt. The report published on Al-Jazeera, showed the scene of a military cap only, and then showed a rifle shooting at two Sisterhood students covered with Blood and then covered with a sheet, lying dead on the floor. Then they showed injuries and described them as Sisterhood brutally beaten inside the universities and then were shot dead by Military Individuals. Later on, other non Sisterhood students informed the University’s administration, about that fake scene they eyewitness , and testified that the 4 girls set the whole fake scene with Al-Jazeera Cameraman and it was published as a special report on Al-jazeera News Agency, Egypt Live. Meantime, some photos were released showing the 3 Sisterhood students and Al-jazeera Cameraman inside the University, taking scenes of one of the 4 girls wearing a military cap (they only filmed the cap from a certain angel to make it look like a military individual), then the cameraman took another scene showing the person who was wearing the cap, holding a rifle (they only took scene of the cap and the rifle) to make it look like that military individual shot the two girls dead. After that report was published and other students testified the fake story of the 4 Sisterhood students, The University’s administration, called the 4 students to investigate about that fake torture and death scenes, (4 girls are alive with no single scratch any where), and the fake blood and the torturing marks they used to film the scene, turned out to be Makeup colors. The university announced that it is taking the necessary measures against those 4 students according to the law, after investigations proved that the whole story was fake and the 4 girls have no single scratch on their bodies, beside that they are ALIVE and not shot dead like they wanted to spread it to the International Medias, to smear the reputation of the Egyptian Military and Police. 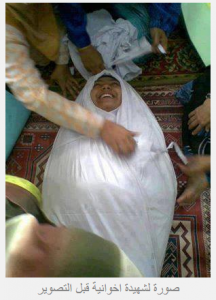 The above screenshot, is for a sisterhood, who is covered in a shroud, and she was supposed to be dead, as the brotherhood spread to the world, and right before Aljazeera takes the shot and report that the poor innocent girl was a victim of the Egyptian Military, Camera man decided to cheer her up while she was supposed to be dead in a few minutes, he was tickling her and she was laughing…Have you ever seen a dead body covered in shrouds, got tickled and laughing before she plays dead?!!! !